Picket at the Board of Higher Education: This Tuesday, April 24, 8:30 am. 1 Ashburton Place, Boston. Encourage your students to attend! ● The Board of Higher Education’s Academic Affairs Committee will be meeting on Tuesday, April 24, at 9 am at One Ashburton Place, Conference Room 1, 21st floor. If you want to give a 3 minute public comment, email by Monday EQuiroz@dhe.mass.edu. The Board of Higher Education members will be attending this meeting. ►The community forum was a huge success! Hundreds of faculty, staff, students, community members, and politicians attended. See coverage of this at the FSU Facebook page and Twitter account and in the Boston Herald and on WBUR. See the remarks given by FSU President Marlene Kim here. 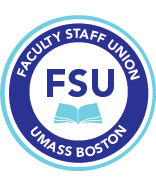 ►The FSU Executive Committee has released a statement in support of UMB Centers and Institutes. See here for the full statement. The FSU Annual Meeting will be held on Wednesday, May 2nd, 12 noon, Wheatley, 2nd floor, Classroom 0198. We will provide pizza. ►Contact your legislators to win health care for adjuncts in state universities, community colleges, and all of the campuses of UMass. Click here for more info.